Composed by Santos Jorge Amatriaim (1870–1941). Arranged by Keith Terrett. 20th Century, World, Latin, Patriotic. Score, Set of Parts. 12 pages. Published by Casio (S0.142879). 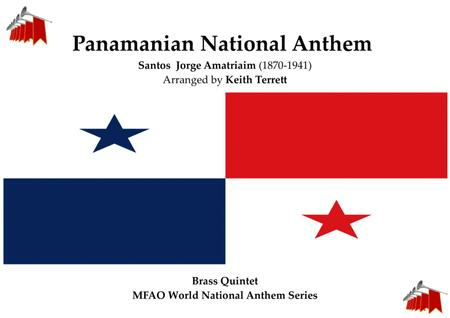 An arrangement for Brass Quintet of the Panamanian National Anthem (Himno Nacional de Panama). The National Anthem of Panama was originally a school song which the composer Santos Jorge Amatriaim (1870–1941)﻿ arranged for its new functions. Jorea was a native of Spain. He went to Panama City in 1889 and stayed there to the time of his death. He composed the ’Himno Istmeno’ (’Isthmus Hymn’) which was declared the country’s official National Anthem in 1903 after the separation of Panama from Colombia. The text of the National Anthem is by JERONIMO de la OSSA (1847-1907). It is expressive of patriotic fervour and shares with other South American National Anthems the division in solo and chorus. It was provisionally adopted by the country’s National Assembly in 1906 and became the official National Anthem in 1925.